The Diamond Ripper™ is a proven high performance blade for breaching and rescue operations. 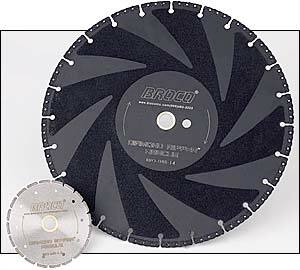 It offers industry-leading features including a thin double-layer diamond cutting edge that yields quick cut times, an aggressive texture to shred materials typically cut with carbide-tipped blades, and a nickel alloy matrix that secures the diamonds to resist erosion and provide superior wear resistance. Diamond Ripper™ 12" and 14" blades are solid core - not laser welded - for maximum durability. And Diamond RipperTM rescue blades are economically priced for the most cost-effective performance. With the Diamond Ripper™ there is no need to: change blades between cutting metal and other materials choose between long blade life and fast cutting speed compromise high inertial force vs. blade flex and binding pay high prices to get top quality The Diamond Ripper™ cuts steel, aluminum, concrete, wood, poly-carbonate and more for forced entry. Diamond Ripper™ combines the best elements of the quick wearing abrasive discs and expensive, heavy tungsten carbide edged blades. The double-layer brazed cutting edge assures aggressive cutting on tough materials, long blade life, and smooth performance to reduce fatigue. The blade's light weight means less gyroscopic effect and more control. The diamond electroplated facing protects the core, reduces heat, and prevents binding. Diamond Ripper™ rescue saw blades are intended for use on gasoline engine powered saws that have 1" or 20mm diameter arbors. Standard blade diameters are 14" (5460 RPM rating), 12" (6300 RPM rating), and 16" (4725 RPM rating). 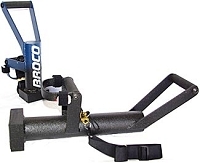 The Mini Ripper™ 4.5" and 7" diameter diamond rescue blades are designed for use with electric grinders to attack chains, locks, door bolts and more. Mini Ripper™ has the same type vacuum brazed diamond edge as the Diamond Ripper™. Maximum RPM is 13,300. It will fit tools with 5/8" and 7/8" (22mm) arbors.